The Bucksport Bay Farmers’ Market is easy to find, right on Main St. in downtown Bucksport next to the Post Office. Find fresh produce, meats, cheeses, baked goods, & prepared foods. The market is conveniently scheduled in the afternoon, & easy to fit in after a busy day. Right across the street there is an excellent view of the Penobscot Narrows Bridge & Fort Knox. 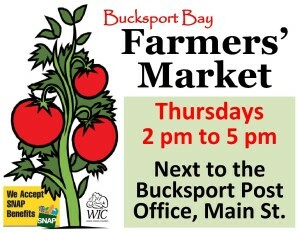 Visit the Bucksport Bay Farmers’ Market 2:00pm-5:00pm on Thursdays from May to October. We are have a fabulous variety food producers who are here to provide you with the freshest and tastiest Maine has to offer! The market’s application and bylaws are available online at the Bucksport Bay Chamber of Commerce website. Outdoor activities near the market: The Bucksport Waterfront Walkway is a mile-long paved path, accessible right across the street from the market. Enjoy the many historic plaques located along the walkway, the boat traffic, & the striking view of the Penobscot Narrows Bridge. Benches make this the perfect site for picnicking & people-watching.